Up for discussion, a beautiful buckskin tobiano filly, will be 3 in May. 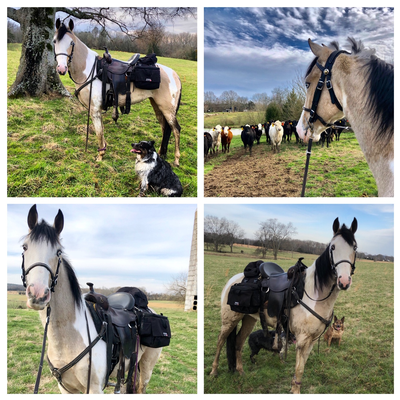 Double reg TWHBEA/SSHBEA current on vaccinations/current coggins, (Allante’s Sapphire Jewel) aka Raina, is currently 15.1 hands estimated to finish out close to 16 hands, she is a in your pocket type personality, very sweet and loving, so eager to learn! 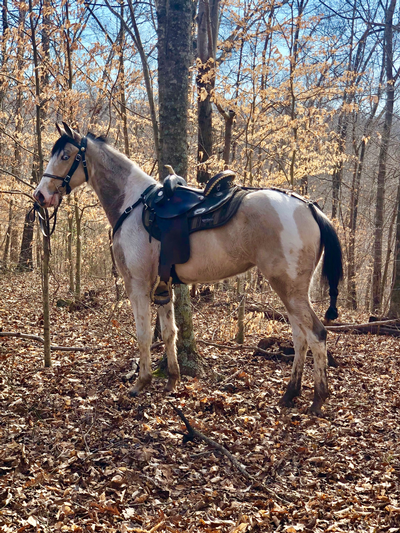 She is currently trail rode in the Tennessee mountains every weekend, and rode on our farm exposing her to cattle, wildlife, farm equipment, roads, crossing water etc, she is healthy in every way not a blemish on her!! She will shed out this spring into a darker shade buckskin, she’s smooth, soft in the mouth, ready to go in any direction!!! Raina is not finished, not a beginner horse. Intermediate and up and she is young. Located in Shelbyville TN. Pedigree posted in comments. call me for more info on this unique filly that will get you noticed, most importantly give you the ride of your life!! Asking $4000. Thank you!